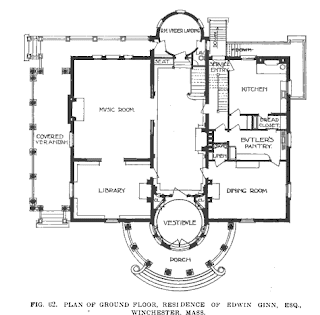 The Edwin Ginn residence designed by Ernest Flagg c. 1900 in Winchester, Massachusetts. 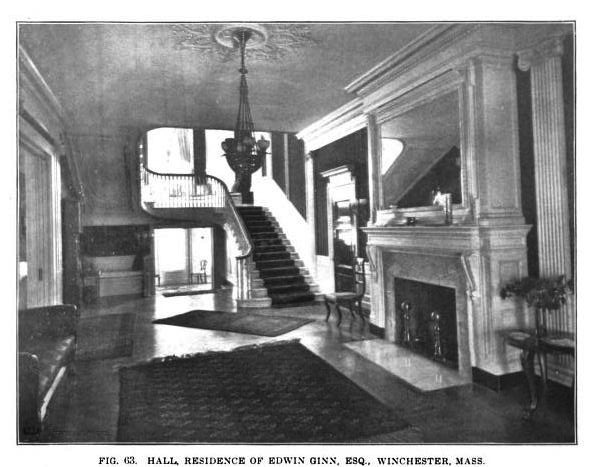 Ginn, a publisher, founded the International School of Peace, now the World Peace Foundation, at Tufts University in 1910. Tufts is also home to the Edwin Ginn Library. The home has since been demolished. 24 Ginn Road, Winchester - History Speaks! The original 3 bay door Ginn Estate Carriage House with horse stalls, tack rm. Smaller portion converted into living area. Presented in its entirety with potential for an add’l lot. The elaborate, large scale and well preserved Carriage House is reflective of the “Beaux-Arts” architecture of the original main house and Music Hall. The U-shape Carriage House has a finished east wing, which was part of the living quarters for the current owner, converted in 1950. 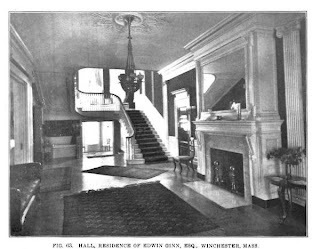 The main bays in the center, as well as the west wing and 2nd story main block retain their original matchboard finish. A trussed roof system limits the need for structural walls in the upper story, providing unlimited opportunities for planning and design. 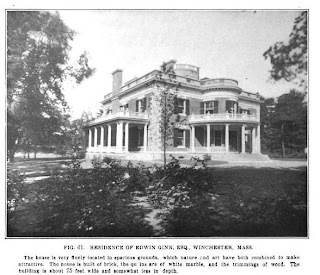 The Carriage House of Edwin Ginn, a prominent publisher of text books, was converted in the early 1900’s. A rare piece of history in Winchester. This was a really nice-looking house. 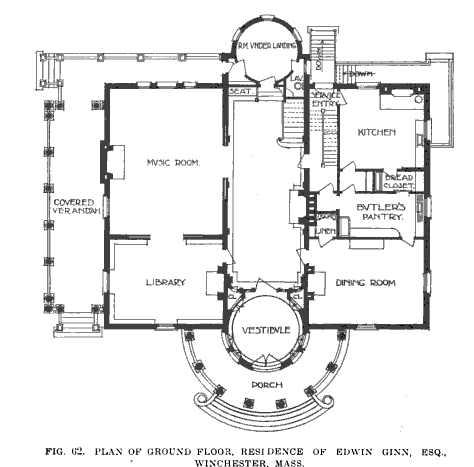 I like the room title for the circular room at the far end of the entrance gallery, "RM. UNDER LANDING". Has there ever been a more simply accurate room name? thanks for clarifying that. I couldn't make it out. probably a nice place to sit, write a letter or play cards.